De André regarded highly the work of Bob Dylan, both for its literary quality and for the many Biblical references found therein. De André considered Dylan part poet and part prophet. This translation was one of the first collaborations between De André and Francesco De Gregori, and it led to the creation of the subsequent album Volume 8.
are for sale, a hundred lira apiece. with her hands resting against her belt. went away in the company of the innkeeper. to water down the joy and the sorrow. watching Jeckyll who is laughing in the mirror. no one ever told her that she’s beautiful. she’s already an old maid. transforming herself into gold she’ll go away. hid his notes in a trunk. straight towards the final Thule. to punish him for his sensuality. And way to go Neptune, joker! The Titanic is sinking in the dawn. are fighting in the captain’s tower. of the ones who know more than they do. you recount everything you’re doing. it doesn’t seem to me that they’re heroes. "Le passanti" is a translation/adaptation of Georges Brassens's "Les passantes" that was released in 1972. The text of the song is a poem by Antoine Pol from his first collection Émotions poétiques (1918). to lose ourselves for another century. in an absence of happiness. without having brushed against her hand. climbed over by a memory more near. the events along the way. of the eyes never again seen. we didn’t manage to not let go. will be worthless for warming her heart. Time flies, you know that it flies and goes. it is we who are leaving. 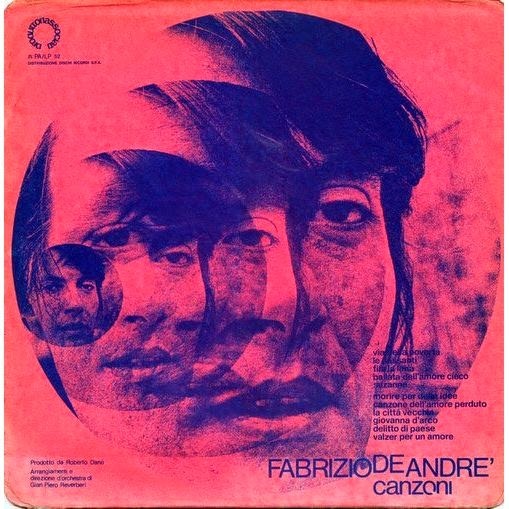 Canzoni, released in 1974, was a "filler" album like Volume III, desired by De André's label. The only three previously unreleased songs here are covers of Dylan's "Desolation Row" and of two songs by Georges Brassens. Also included are two covers of Leonard Cohen songs.